Paragon's American-made Theater 16 Pop popcorn machines are unparalleled in quality and workmanship and are comparable to commercial popcorn machines you find at the movie theaters. If you are looking for the highest quality popcorn machine in the market, you will find it in the Theater Pop. 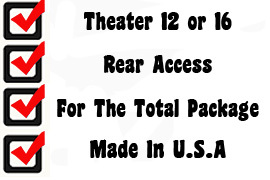 Get the longest warranty in the industry on a 16oz machine with a Theater 16 popcorn popper. Orders yours today! 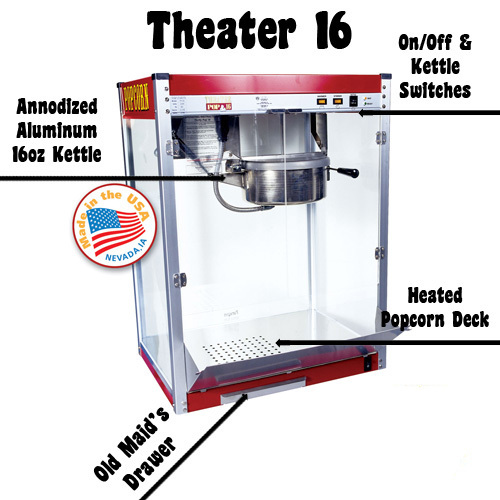 Paragon's American-made Theater 16 Pop popcorn machines are unparalleled in quality and workmanship and are comparable to commercial popcorn machines you find at the movie theaters. If you are looking for the highest quality popcorn machine in the market, you will find it in the Theater Pop. 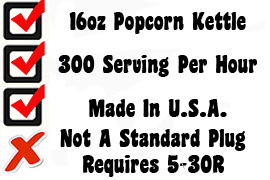 Get a great warranty with the 16oz machine with a Theater 16 popcorn popper. Orders yours today! This machine requires a dedicated circut. Please call and we'll be happy to explain. A clean popcorn machine will last longer. This Early American Style popcorn cart is pictured with the 16oz popper. It measures 21"W x 45"D x 33"H. Perfect for a recreation room or den. This cart is only required for the 12 & 16oz machines. Best purchased with larger machine. Can be combined for better ship cost.